Outdoor enthusiasts, your adventure is waiting - in vivid detail. TOPO U.S. 24K - Mid-Atlantic brings you the highest level of topographic detail available, with maps comparable to 1:24,000 scale USGS maps. These highly detailed maps include terrain contours, topo elevations, summits, routable roads and trails, parks, coastlines, rivers, lakes and geographic points - and they also display 3-D terrain shading on compatible devices. 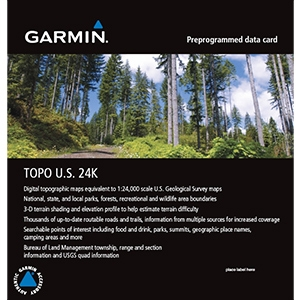 TOPO maps are ideal for hiking, hunting, camping, cycling and communing with nature. Coverage includes topographic detail of Delaware, Maryland, West Virginia, Virginia, Kentucky, Tennessee, North Carolina and South Carolina.